The belated results were released last Friday, when Team Athletics SVG made public its Newsletter no. 4. KPS, under the headship of the tireless teacher Ian Sardine, with visible support from parents and Principal Carol Ross, amassed 320 points, to be crowned champion. KPS distanced second place X- Cel Sports Club, whose tally was 222 points. Petit Bordel Secondary School settled in third position with 188 points. Chateaubelair Primary was fourth with 138 points, Bethel High School fifth with 132 points, and Overland Primary sixth with 122 points. The top 10 places were completed by North Leeward with 110 points in seventh position, Buccament Secondary in eighth position with 100 points, Sandy Bay Primary in ninth place with 92 points and the St. Vincent Grammar School, 10th place with 90 points. A total of 25 teams competed in the National Relay Classic. The well-attended and highly competitive event has been the highlight, so far, of the Team Athletics 2011 calendar. 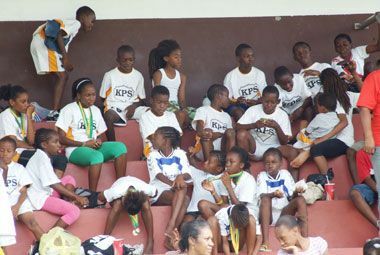 The Relay Class saw competition in the Under-7, Under-9, Under-11, Under-14, Under-17, Under-19, and Open categories, for both males and females. Athletes are now looking forward to the National Lotteries Authority Inter Secondary Schools Meet and the revived Zonal Primary Schools championships. The preliminaries for the Zonal Primary Schools Meet are in progress, with the Girlsâ Heats for the Secondary Schools competition set for March 23, at the Arnos Vale Playing Field, and the Boysâ Heats, the following day at the same venue.